Bring For Ahkeem to Your School or Community! We are so thrilled to offer free screenings of the film to schools and communities across the country. The initiative will spark discussion and action around the school-to-prison pipeline with students, parents, juvenile justice workers, and policy makers. We’re focusing the campaign in seven cities, but the screenings and actions are happening across the country. Become part of the campaign. Download a discussion guide and check out our Take Action page for tips on how to engage with your school or community—and help us spread the word to others who should see the film! We're so thrilled to partner with the folks at Film Sprout on this—they are the leading outreach firm specializing in distributing social-issue documentaries through grassroot and classroom screenings. Thanks to generous support from The Fledgling Fund and AFI Docs/NBCUniversal for making this possible! For Ahkeem is now streaming on Amazon Prime Video! 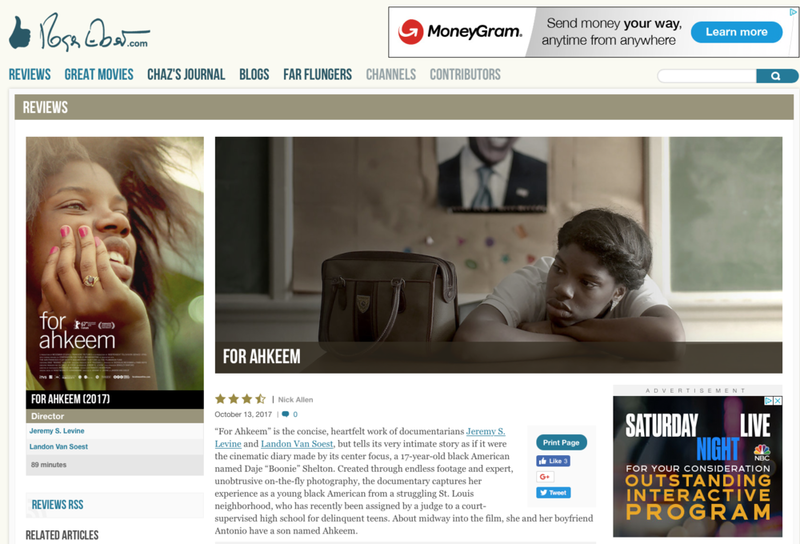 We are so excited to bring the film to such a large audience—now anyone with an Amazon Prime account can watch For Ahkeem for free. Please help us spread the news and tell your friends to add it to their Watchlist. Thanks to our distribution partners at The Orchard for making this dream come true! And if you don't have Amazon Prime, For Ahkeem is also available on iTunes and pretty much every other video on demand service! Top Prizes at Stockholm and Memphis, Local Win in St. Louis! We are humbled and honored to see For Ahkeem honored by the Stockholm Film Festival, the Indie Memphis Film Festival, and the St. Louis International Film Festival! For Ahkeem received the Bronze Horse for Best Documentary at the Stockholm Film Festival. (And apparently it's the heaviest festival prize in the world!) The jurors wrote that For Ahkeem "is a nonjudgmental, intimate and warm portrayal of love and hardship set against the backdrop of police brutality. It depicts, in a very organic way, what it takes to survive as young people today, with the odds stacked against them." The film also won Best Documentary Feature at the Indie Memphis Film Festival—which was awarded on the night of Ahkeem's birthday! Finally, following a sold-out homecoming screening in St. Louis, we couldn't be more excited to see the film honored with the Midrash Award at the St. Louis International Film Festival. This is a special one for us. "The Midrash St. Louis Film Award celebrates St. Louis-related films of honesty and artistry that portray the need or the hope for reconciliation or redemption. These are among the most powerful and worthy themes that films should explore." We're thrilled that the film resonated so strongly in St. Louis. And that brings the full count of awards up to 10—including 7 "Best Feature Documentary" awards. Thanks for all of the love out there! You know it's a good review when your film is mentioned in the same breath as Truffaut! We're thrilled to get the thumbs up endorsement of RogerEbert.com and really moved by the touching review from Nick Allen. For Ahkeem wins 4 awards in 2 weeks!!! We are blown away that For Ahkeem won the top feature documentary awards at four festivals over the last two weeks! In addition, Daje was named on the list of "Unforgettables" on the Cinema Eye Honors, a list of films that "helped to define documentary cinema in 2017” according to IndieWire. She's certainly unforgettable to us. For Ahkeem was recently awarded the Grand Jury Prize for Best Feature Documentary at the Independent Film Festival Boston. We are thrilled with this recognition among such an amazing slate of films, including the Special Jury Prize winner Maineland. And we had a great time in Boston, where Daje received a standing ovation from the sold-out audience. The film was also awarded a Special Jury Mention for Best International Film at the Doc Edge Film Festival in New Zealand. And we've got a great line-up of festival screenings this month including Sheffield Doc|Fest in the UK, AFI Docs in DC, and the Nantucket Film Festival in MA. Hope to see you there! For Ahkeem a New York Times Pick at the Tribeca Film Festival! The New York Times recommends For Ahkeem as 1 of 12 films in its curtain raiser of the 2017 Tribeca Film Festival. "This up-close, slice-of-life documentary profiles Daje Shelton, an African-American teenager in north St. Louis struggling with school, family and motherhood. During the two years covered in the film, Daje and her friends see the news that Michael Brown has been killed by the police in nearby Ferguson." No Film School also lists the film as one of the 10 movies they're excited to see. "We don’t see many stories of young black girls on film, but when we do, they tend to be powerful. Think about how Beasts of the Southern Wild shook up the independent film world and beyond. That’s part of why we’re excited to check out For Ahkeem, which focuses on a 17-year-old student in North St. Louis, near Ferguson, Missouri, where fellow black teenager Michael Brown had been shot and killed by police during production on the film. The documentary, which has already screened at the prestigious Berlin International and HotDocs Film Festivals, looks to be an intimate coming-of-age story, but its sociopolitical backdrop gives the story gravity. The team behind the work also gives it real promise: Emmy award-winning directing team Jeremy S. Levine and Landon Van Soest, editor Lily Henderson (named to Filmmaker Magazine’s “25 New Faces of Independent Film” list last year), and 2016/2017 Sundance Creative Producers Fellow Iyabo Boyd. —Liz Nord"
Meanwhile Steve Koplan of Unseen Films calls For Ahkeem “an early favorite of the festival." Our U.S premiere is off to a strong start. In the next two weeks after our Tribeca premiere, we'll be taking the film to Hot Docs in Toronto, the Florida Film Festival in Orlando, the Independent Film Festival Boston, and the Montclair Film Festival in New Jersey. It's going to be a busy month! Directly following our North American premiere as an official selection of the 2017 Tribeca Film Festival, we're heading to Hot Docs, North America's largest documentary festival. We are thrilled and honored and can't wait to bring the film to new audiences. Stay tuned for more announcements soon! "North America's largest documentary festival will open with a world premiere of Lana Slezik's debut feature documentary, Bee Nation, a film about an indigenous spelling bee. Other docs to unspool in Toronto this year include a world premiere for Pre-Crime, Matthais Heeder and Monika Hielscher's film about algorithms used to predict future crimes; Nick Broomfield's Whitney. "Can I Be Me," to debut at Tribeca; Matthew Heineman's City of Ghosts, a film about Iraqi citizen journalists from Amazon Studios; and For Ahkeem, Landon Van Soest and Jeremy Levine's coming-of-age portrait of a black teenager against the backdrop of the 2014 Ferguson uprising." We are so happy to bring the film home and launch it to the United States as an official selection of the 2017 Tribeca Film Festival. Daje Shelton will be braving boarding an airplane for the first time to be in attendance for the first three screenings. We're very excited to have her there, along with Judge Jimmie Edwards for our premiere on Sunday 4/23 and many of the filmmaking team that made it all happen. Hope to see you there! The Forum section of the Berlin International Film Festival revealed its lineup Wednesday, with 43 films in its main program, 29 of which are world premieres and 10 are international premieres. The Special Screenings will be announced separately. North American cinema once again has a strong presence in Forum. The 47th Berlinale Forum is showing 43 films in its main programme, 29 of which as world premieres and 10 as international premieres. This year’s programme shines a light on the sheer wealth of forms employed by the documentary, including films from Southeast Asia, Europe, North America, Latin America, the Middle East and Africa. The spectrum could hardly be broader here, encompassing institutional portraits, long-term observational projects, and works that employ participatory, narrative, essayistic, ethnographic, political and experimental approaches. These are joined by various hybrid forms that cannot be clearly categorised as either fiction or non-fiction. One recurring motif is that of landscape, which is seldom relegated to the status of backdrop, but rather frequently takes on a leading role. One regional focus is formed by films from Latin America, with six works from Brazil, Peru, Chile, Mexico and Argentina exhibiting a wide range of different formal approaches. What It’s About: Beginning one year before the fatal police shooting of a Black teenager in nearby Ferguson, Missouri, For Ahkeem is the coming-of-age story of Daje Shelton, a Black 17-year-old girl in North St. Louis. She fights for her future as she is placed in an alternative high school and navigates the marginalized neighborhoods, biased criminal justice policies and economic devastation that have set up many Black youth like her to fail. The funds will support the feature-length documentaries in post-production. The documentary follows Daje Shelton, a 17-year- old Black girl from north St. Louis, Missouri as she strives to graduate from the nation’s only court-supervised public high school. Daje fights for her future as close friends are killed, her sixteen-year- old boyfriend Antonio is sent to jail and nearby Ferguson erupts after the police shooting of Michael Brown. Through Daje’s intimate first-person account, the film explores the complex web between juvenile justice, education and race in America today. Los Angeles, CA — Sundance Institute today announced the participants for its weeklong Creative Film Producing Initiative at the Sundance Resort in Utah, August 1-8, including eleven feature film and documentary projects for the Creative Producing Labs, and more than 50 industry leaders for the Creative Producing Summit. The Institute’s Creative Producing Initiative encompasses a year-round series of Labs, Fellowships, granting and events focusing on nurturing the next generation of independent producers and renewing the community of veteran producers who sustain the vibrancy and vitality of independent film. The Documentary Film Creative Producing Lab (August 1-5) brings together emerging documentary feature producers with experienced advisors to refine and deepen the creative potential of their projects, while also focusing on the editorial, strategic, and interpersonal skills critical to being a successful Creative Producer. This fellowship includes group feedback, one-on-one meetings and sustained mentorship over the course of a year. This year’s Creative Advisors include producersDaniel Chalfen (Silenced), Julie Goldman (Life, Animated) and Josh Penn(Beasts of the Southern Wild ). Los Angeles, CA — Sundance Institute and Skywalker Sound today announced the composers and directors selected for the Sundance Institute Music and Sound Design Labs at Skywalker Sound . This will be the fourth year the Music and Sound Design Labs take place at the Skywalker Ranch in northern California. Half of this year’s composing Fellows are women, extending the Institute’s commitment to female artists to a creative branch of filmmaking with an especially low percentage of women represented. The Music and Sound Design Labs provide a space for composers, directors and sound designers to collaborate on the process of providing music and sound for film. Fellows participate in workshops and creative exercises under the guidance of leading film composers and film music professionals acting as Creative Advisors. Each composer/director team will have their original scores for new independent film scenes performed live by a chamber orchestra. The Music and Sound Design Lab for narrative feature films (July 7-20) is a joint initiative of the Institute’s Film Music Program and Feature Film Program, and the Music and Sound Design Lab for documentaries (July 22-30) is a joint initiative of the Film Music Program and Documentary Film Program. The Labs are part of 24 residential labs the Institute hosts annually to discover and foster the talent of emerging independent artists in film, theatre, music, new media and episodic content.